Many congregations are experiencing significant change both within and beyond their walls, and both members and leaders feel a sense of loss in the midst of these changes. In the midst of change, loss, and grief, congregations yearn for leadership--typically with differing expectations of what constitutes effective leadership in response to their needs, hopes, and priorities. At the same time, congregations resist leadership. After all, leadership assumes those who follow will be open to more change. 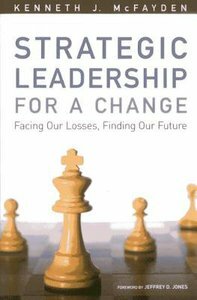 Strategic Leadership for a Change provides congregational leaders with new insights and tools for understanding the relationships among change, attachment, loss, and grief. It also helps to facilitate the process of grieving, comprehend the centrality of vision, and demonstrate theological reflection in the midst of change, loss, grief, and attaching anew. All this occurs as the congregation aligns its vision with God's and understands processes of change as processes of fulfillment. About "Strategic Leadership For a Change"